We're the most experienced and trusted reseller in the world, specialising in comprehensive deployments unique to each customer's needs. Our services include project management/guidance, guided installations/configurations, custom workflows, onsite or remote training, and unparalleled customer support. Dragon is the best speech recognition, transcription, and dictation software that offers accurate voice to text technology. Medical practitioners, legal consultants, corporate professionals, government organisations, and individuals can leverage its front-end dictation features. From making status updates and searching the web to creating reports and spreadsheets, Dragon speech recognition software lets you do it all—faster and more efficiently—whether you're a student, a professional, or an enterprise user. Talk and your words appear on the screen of your PC, Mac, or smartphone. Say commands and your device obeys. Dragon is 5x faster than typing manually and it's accurate. Master Dragon right out of the box, and start experiencing big productivity gains immediately. AWS is Nuance authorised sales agent, integrator, trainer, and support provider having presence in Sydney, Australia and Georgia, United States. We're the best Dragon international reseller, providing superior solutions and services to our customers world-wide for two decades. 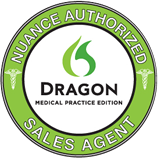 We provide unparalleled deployment and customer service while integrating and maintaining Dragon Speech recognition solutions for medical and professional clients around the globe. We're your one-stop shop to buy Dragon in Australia and USA.